I was sent some of these delicious Zone Perfect bars for review. 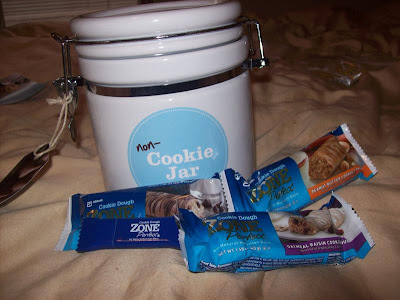 I got to try the chocolate chip cookie dough, oatmeal raisin cookie dough, and the peanut butter cookie dough flavored. These are AMAZING! They truly have the consistency of cookie dough and taste great. My favorites were the chocolate chip and the oatmeal raisin. If you are a fan of cookie dough, I would highly recommend these. Also, according to the company, these bars are an "excellent source of protein, a good source of 17 vitamins and minerals, and rich in antioxidants (Vitamins C & E, and Selenium) for a soft, chewy snack with a cookie dough texture". They have 170 calories and 10 grams of protein. One downside of these bars that I would change is that they have less than 1 gram of fiber which is very low and they have 16 grams of sugar. Also, these bars came in a super cute cookie jar! Looks like my puppy Ava finally has a place for her doggie treats to go! Thanks Zone Perfect!